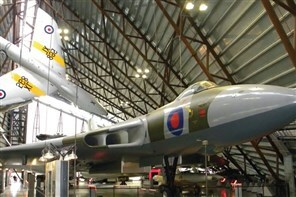 This year discover our fantastic site of Cosford in Shropshire. We are free to enter and offer a great day our for all. Explore the fascinating story of the RAF and of the thousands of ordinary Servicemen and women who have served in it and whose invaluable contribution has shaped the world that we live in today. There is a huge array of aircraft and displays at Cosford. We recommend you allow four hours for a full site visit which will take in the Wartime Hangars and National Cold War Exhibition. During your visit you are welcomed on arrival in the Visitor Centre and this glass fronted building offers views over the airfield. Hangar 1 is home to the transport and training collection and many engines and missiles. There is a temporary exhibition gallery and art gallery with works for sale from the Guild of Aviation Artists. We hope you enjoy your visit and that you will visit again in the not too distant future. You will also find the 1:1 scale Airfix Spitfire as featured on the James May Toy Stories series shown on BBC2, complete with a model pilot.